Gold prices jumped following Fed’s Chairman Powell speech that pushed the greenback sharply to the downside. The yellow metal moved from its recent lows just above the $1211 level all the way to $1226 in a couple of minutes after Fed’s Powell said the policy rate “remains just below the broad range of estimates of the level that would be neutral for the economy” which triggered a rally in equities and a slide of the US Dollar. 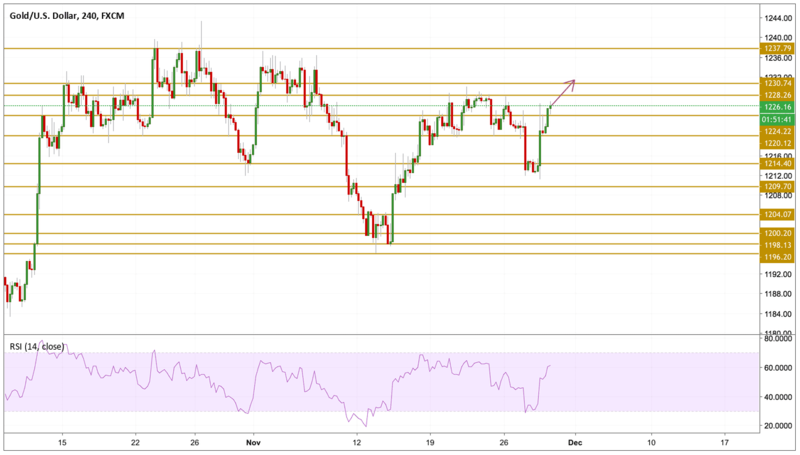 Gold prices eliminated their Tuesday's losses by climbing back to the recent tops just below the $1228.26 resistance level. The price is currently at $1226 per ounce with a firm support from the bullish momentum as we can see on the chart. If the price manages to break above the $1228.74 stubborn level, then we will be looking for a consolidation above the $1230 level.